WestJet’s top line financial strength is largely being ignored by the stock market as its share price remains down from highs achieved in Dec-2014 even after the airline recently posted a record 3Q2015 result and expanded its targets for return on invested capital (ROIC). Similar to other North American airlines, WestJet has encountered pressure on its unit revenue and yields, driven by industry capacity increases and its exposure in the Canadian province of Alberta, where the economy has a large dependence on the oil and gas sector. Despite the unit revenue headwinds, WestJet is defending its decision to revise domestic capacity revisions upwards for 2015. The company believes the stimulative effect of its Encore regional subsidiary, coupled with its strong financial performance, allow for capacity growth that is not tied to Canadian GDP. WestJet grew its 2Q2015 earnings by 19% to CAD62 million (USD47.3 million). Its operating margin increased 2.3ppt to 10.7%, and its ROIC was 16% for the 12M ending 30-Jun-2015. The airline has outperformed its 12% ROIC target for 12 consecutive quarters, and has opted to raise its targets to 13%-16%. But that performance has done little to change WestJet’s stock price, which prior to a bump on 6-Aug-2015, after the pilots narrowly voted to reject union representation, was down year-on-year. Even its 6-Aug close of CAD23.54 was below its peak of CAD34.27 in Dec-2014. WestJet CEO Gregg Saretsky recently expressed frustration about the market’s lack of response to the company’s strong top line financial performance, highlighting expanded margins and earnings and its ROIC performance. Eventually, he stated, “the market will get that right”. 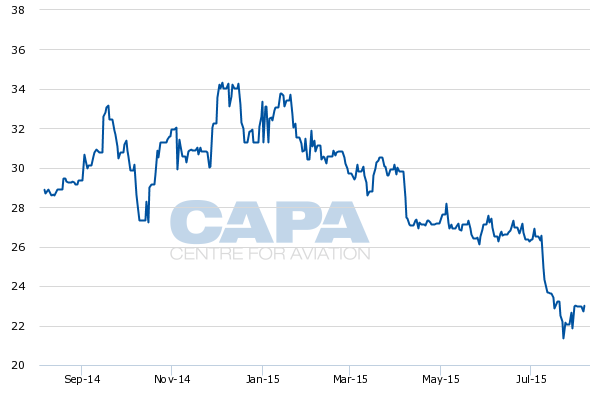 WestJet in 2015 has faced unit revenue and yield declines, which could be driving some investor trepidation. During 2Q2015 its unit revenues fell 5.7% year-on-year and yields decreased 4%. For 1H2015, the company recorded 3.2% drop in unit revenues for and a 1.3% slide in yields. Competitive capacity in some regions, notably winter sun destinations, pressured WestJet’s unit revenues in 1Q2015, with some carry over into 2Q2015. Its unit revenue and yield performance in 2Q2015 was also challenged by weakening demand in the oil and gas sector in Alberta, driven by layoffs in that business segment. WestJet’s headquarters of Calgary is located in Alberta, and it is also the largest airline in Edmonton (also located in the province), with a 53% share of system wide seats deployed from the airport for the week of 3-Aug-2015 to 9-Aug-2015 and a 58% share of domestic seats. Calgary is WestJet’s second largest base measured by ASMs, and largest by frequency deployment. Edmonton is the airline’s fourth largest base by ASMs, and third largest by frequency. It is not clear when the pressure in Alberta will bottom out, but WestJet executives remarked that its routes in the province were still performing well on an absolute basis. Mr Saretsky also highlighted that WestJet has some natural buffer from the declines in the oil, gas and construction sectors in Alberta due to crews working on projects within the region now travelling with scheduled airlines rather than charter companies. Mr Saretsky also concluded that with the tailwinds created by the significant drop in fuel prices, the airline has some liberty to act more aggressively on fares. But he stressed WestJet has not dropped fares as much as making more of its lower fares available. WestJet’s planned 9.5% to 10% domestic capacity growth in 3Q2015 and system capacity growth of 7% to 7.5% seems high given that Canada’s economy is choppy, with fives months of GDP contraction as of May-2015. The airline is planning 4.5% to 5.5% system capacity growth for 2015 (up from previous estimates of 4% to 5% for both system wide and domestic capacity). Company EVP of sales, marketing and guest experience Bob Cummings stated that broadly WestJet has always added capacity during peak periods. Roughly half of the 3Q2015 increase and full year 2015 domestic increase is fuelled by Encore expansion. Mr Saretsky concluded that Encore has entered numerous markets and stimulated demand with fares 30% to 40% lower than what was previously available. In this case, capacity growth is not linked to GDP demand when Canadians are seeing low fares for the first time. “There’s a tremendous growth multiplier there,” said Mr Saretsky. WestJet has previously estimated that Encore will offer 146 daily departures to 31 stations by Oct-2015 (the 146 is based on a typical Wednesday in Mar-2015). Noting that WestJet was making a lot of Canadians happy and filling up a lot of planes, Mr Saretsky stated the airline “was not apologising” for its planned 3Q2015 domestic capacity increase. WestJet for 2Q2015 and 1H2015 posted what should be generally considered healthy load factors of 78%, and 80%, respectively. But its loads declined 1.5ppt in each time period. Company management remarked the decline was partially driven by WestJet’s quest to increase its mix of corporate travellers, which lessens the number of leisure customers that travel. As the Encore Bombardier Q400 turboprops start to comprise a larger portion of WestJet’s overall fleet – the company recently exercised five purchase options for 36 firm orders – their lower 70-seat capacity is also a drag on WestJet’s load factor. 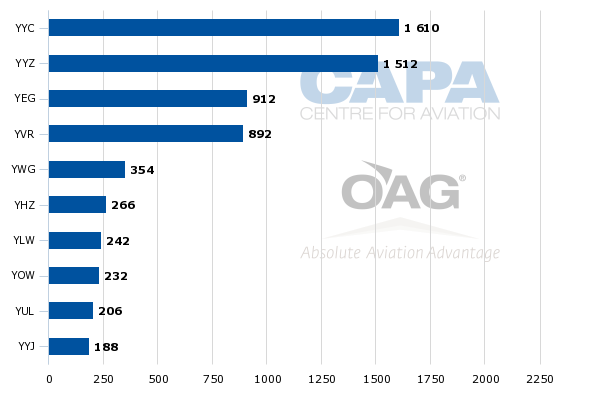 The CAPA Fleet Database shows that Encore is operating 23 of the turboprops as of 7-Aug-2015. One strategic move WestJet is making in 2015 to enlarge its corporate traveller base is refining the onboard offering of its Plus fare category, the highest priced option with the most flexibility. It is blocking out the middle seat on its Boeing 737 narrowbodies in the extra legroom Plus section beginning in Sep-2015. 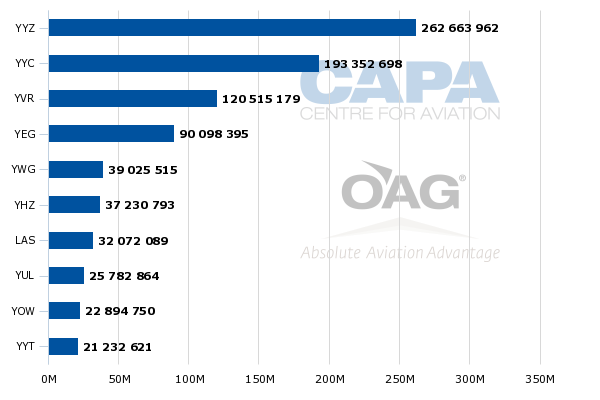 As of 7-Aug-2015 the airline had 108 737 narrowbodies in its operating fleet. Orders include those placed directly by the operator and by lessors assigned to the operator, from 7-Aug-2015 onwards. WestJet management concludes the new Plus configuration is a unique opportunity, basing its assessment on the fact that the extra legroom offering is priced 50% to 70% lower than business class on Air Canada, and is entering the market at a time when many corporations are prohibiting business class bookings for flights under five hours. The elimination of the middle seat on a portion of the 737s, and taking some aircraft out of service to equip the jets with Wi-Fi and a new in-flight entertainment system are some of the drivers for WestJet’s slower 2% system capacity growth in 4Q2015. WestJet never offers specific unit revenue guidance on a quarterly basis, and for 3Q2015 it has only stated that its decline in that metric will improve sequentially over 2Q2015, where the decrease was in the mid-single digits. At the same time WestJet predicts it will post its best operating margin during the last five years in 3Q2015, and pledges record net earnings, no doubt driven by the benefits of lower fuel prices. Perhaps investors are still unsure of how to reconcile record earnings that are driven in large part by declines in energy prices with capacity increasing in a fragile economy and unit revenues declining through at least the first nine months of 2015. WestJet historically has managed through tough situations and the cyclicality of the airline business; and there is no reason to doubt that 2015 will not be a banner year for the airline. But underlying challenges remain – namely the threat of industry oversupply. WestJet is currently evaluating its capacity projections for 2016, perhaps with an eye to slightly toned down growth.